Founded in 1096 St. Martin’s ales are now brewed by Brunehaut Brewery in the same time old tradition. Only four beers make up this line so I choose the darkest brew. 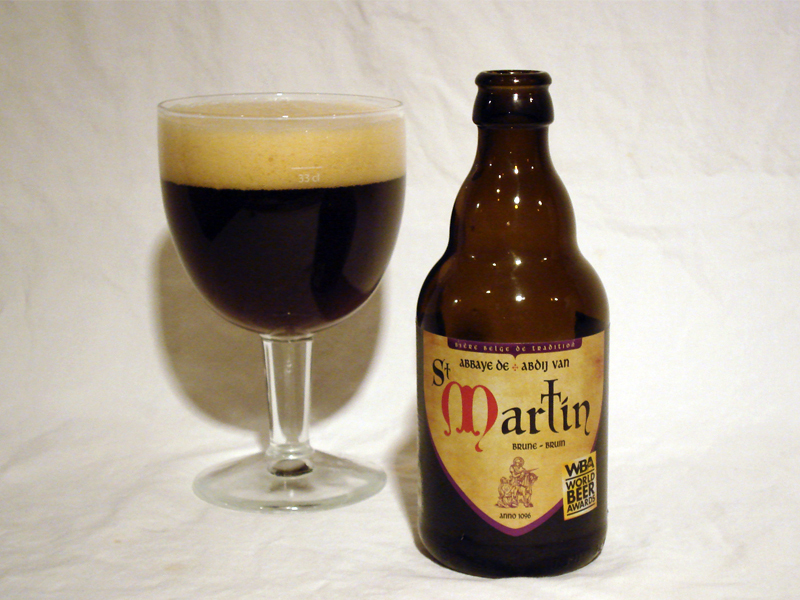 A Dubbel by style, this beer has a slightly higher abv similar to that of Trappist Achel Bruin or St. Bernardus Prior 8. The label includes a small notation regarding the 2009 World Beer Award where it won ‘World’s Best Dark Abbey.’ Note: while this beer is an officially registered abbey beer, it is not a Trappist. Poured into my standard chalice, it produced a moderately dense foamy head that was beige in color. This rested atop a rich mahogany beer that bubbled just enough to keep a film over the beer. The aroma was almost too complex for just a Dubbel. Big licorice notes wafted from the glass. Deep candied aromas gave off hints of dark fruits mixed with chocolate. A spicy yeast profile was also evident added notes of black currants and helped to mask the abv with a bready quality. Surprisingly drinkable. I was expecting a light mouthfeel and an abv heat, but instead it was rather silky and smooth. The earthiness of the licorice adds a great touch to this brew as it counters the candy sugar character. It is sweet up front however there are enough dark grain flavors to help carry and evolve that sweetness as you drink. With an ever-so-slight dryness on the finish, it leaves you with hints of plum, dates, cherries and chocolate. Overall, I’d say this beer won me over. Yes, it might be an middle of the road Dubbel to some, but given the flavors and complexity it could stand up to the Trappists quiet easily. – A-HA! Thanks to Anda.I like this post, as well as your last one SO SO much I can’t even begin to explain. As I was jiammn’ to some music in my car yesterday and the sun was setting I thought about this and how life is so much better if we notice the things we enjoy, rather than the negatives. Thanks girl.